The Cholla Cactus Garden in Joshua Tree National Park is a great place to view a dense grove of cacti. The 1/4 mile hike is right off Pinto Basin Road in the southern end of the park. David and I visited the garden under an almost full moon, and were the only ones there. I setup my tripod to take a panorama next to some cholla that were quite tall. The anthropomorphic cacti swayed in the wind under the moonlight. 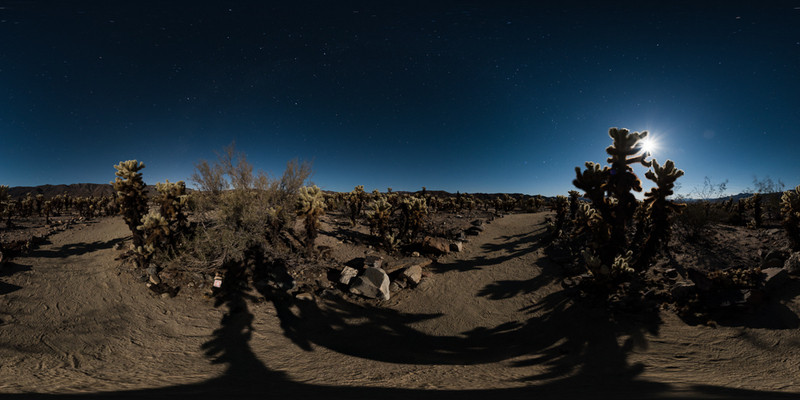 Click below to view 3 night panoramas from the Cholla Cactus Garden. Technical Details: Nikon D750 with Samyang 12mm fisheye lens, Sirui N-2204X carbon fiber tripod, Nodal Ninja R1 panohead. 6 shots around at an angle, and 1 down shot (nadir). Processed in Lightroom, stitched in PTGui Pro, output in krpano.